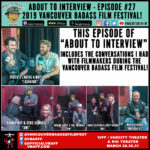 This episode of the “About To Review”/ “About To Interview” podcast features interviews I conducted while covering the 2019 Vancouver Badass Film Festival (VBAFF.com). There are talks with writers, directors, producers, actors and more! 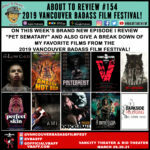 On this week's episode I review "Pet Sematary" and also give a full breakdown of the Vancouver Badass Film Festival (VBAFF) which I attended this past weekend! This episode of the “About To Review”/ “About To Interview” podcast features interviews I conducted while covering the 2019 Vancouver Short Film Festival (VSFF.com). There are talks with writers, directors, producers, actors and more!